Well, it’s happened. After 16 years in opposition, the B.C. NDP will be sworn in as government. 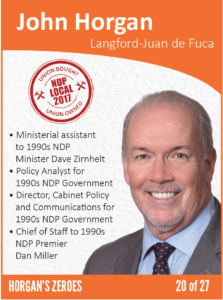 John Horgan is B.C.’s 36th Premier – and sixth from the NDP (following Barrett, Harcourt, Miller, Clark and Dosanjh). The only people happier than the NDP today will be their union masters. They’re already pushing to take B.C. back to the 1990s in labour laws, taxation levels, closed shops, sectoral bargaining, and who knows what else. Think we’re jumping the gun? 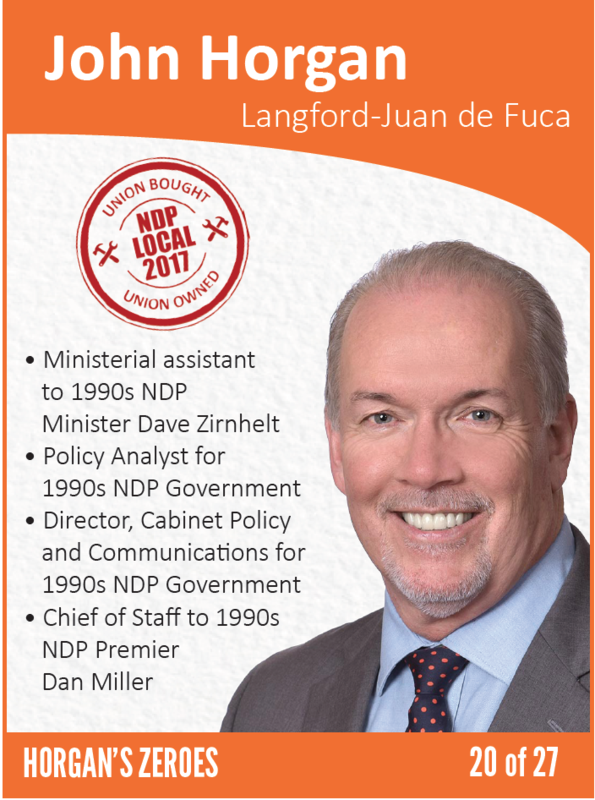 Take a look at the background of the NDP MLAs. You’ll note a stunning lack of small business owners, corporate managers, or job creators. You will, however, see union activist after activist, various union bosses, and lots of former NDP staffers. To help you sort out the new players, we’ve launched a series of 27 trading cards. Our Horgan’s Zeroes set details the NDP, labour, Communist Party (we’re not kidding!) and various other leftie credentials of 25 BC NDP MLAs and 2 key staffers. Download your free set of Horgan Zeroes HERE. Print them! Trade them! Add them to your dartboards!